Fall in love with Lake Lugano! Providing spectacular views over the breathtaking Lake Lugano, this modern townhouse provides a luxurious lakeside retreat perfect for families and large groups to enjoy! The holiday home has been furnished to a contemporary high standard throughout and boasts extensive and flexible accommodation over two floors, making it ideal for a large family or for two families staying together. Guests can relax and entertain in the two spacious lake and mountain-view reception rooms, which are conveniently accompanied by two fully-equipped kitchens and offer easy access to a sunny lake view balcony terrace to the first floor, and a covered outdoor dining terrace with lake views and BBQ to the ground floor. All the must have mod-cons are provided in the property and guests can fully relax and unwind in their very own lakeside haven, with a sunny garden to enjoy alongside a private lakeside sundeck, private beach and a private mooring facility is available for guests to use at a cost of EU150. The internal sleeping accommodation in the villa offers extensive sleeping arrangements to suit groups of up to 12. The 4 spacious bedrooms comprise a lake view double bedroom, a second lake view double bedroom with extra double bed, a twin lake view bedroom and a lake view children’s room furnished with a set of bunk beds. A comfortable double sofa bed also features to the villa for additional guests. A newly fitted family bathroom with bath tub and power shower features to both the ground floor and first floor of the villa and modern laundry facilities are also provided, for a hassle-free self-catering stay! A private garage for up to 2 cars is provided in the grounds of the holiday home and guests are perfectly located in the village of Cima to reach the nearby modern day amenities of Porlezza. The surrounding Italian and Swiss Lake District offer opportunities for hiking, golf, tennis, horse riding, cycling, water sports, swimming and more, alongside a host of authentic local restaurants to enjoy and visitor attractions to explore. The Swiss lake capital of Lugano provides elegant cafe-lined piazzas, designer shopping and contemporary bars and casinos to enjoy throughout the day and well into the night. 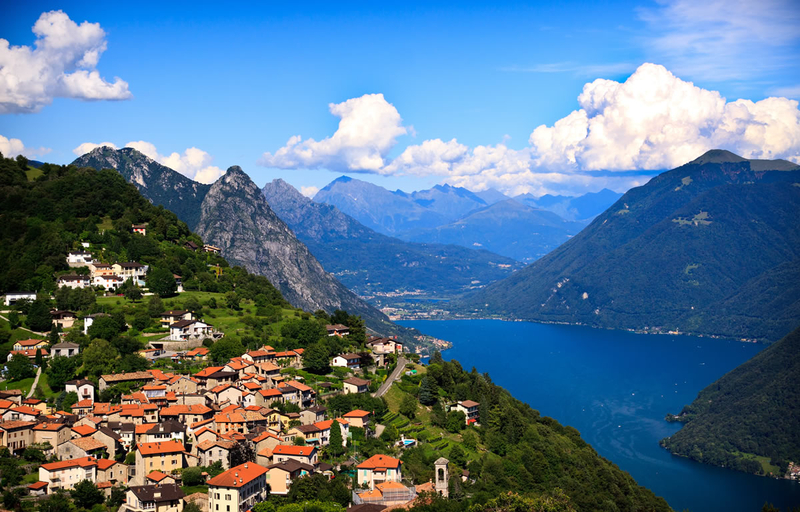 Nearby Lake Como offers a more sedate pace, with picturesque resort towns and romantic villa gardens to explore and world class golf, water sports and hiking routes just waiting to be enjoyed! Guests can experience a wonderful holiday here in all seasons; with long lake summers, cosy ambient autumn times and magical winter scenes with Christmas shopping and skiing!